Use of insecticide-treated nets (ITNs) is one of the main interventions to prevent malaria, and high ITN use rates are a central goal of malaria programs. The four standard indicators to assess outcomes have assessed the percentage of: 1) households owing at least 1 ITN, 2) population with access to an ITN within their household, 3) households owing at least 1 ITN for every 2 people, and 4) population that used an ITN the previous night. It is common for countries to find a gap between ownership of at least 1 ITN and % people that used an ITN the previous night. This "net use gap" is often referred to by program planners when looking at the standard indicators of household ITN ownership and population ITN use. The ratio of people who used a net to those who could use a net provides a more accurate representation of the net-use gap, and sheds light on net use behavior. On the whole, over 80% of those with access to an ITN within their household reported using an ITN the previous night. This has significant implications for planning behavior change interventions to increase ITN use. Previous interpretations of the net use gap as a failure of behavioral change communication interventions may not be justified, if that gap is instead primarily driven by lack of intra-household access to ITNs. We welcome your contributions to this topic! If you have articles, tools, or other materials you'd like to share, please contact the Health COMpass curator, Suisan Leibtag, susan.leibtag@jhu.edu. Koenker, H. et al. 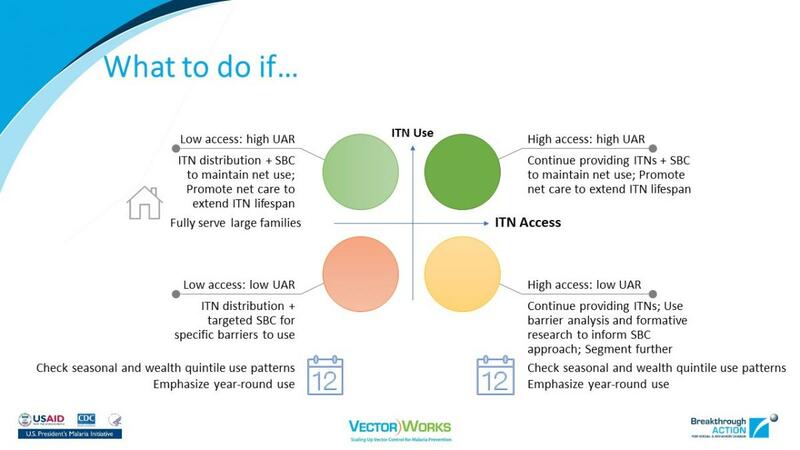 (2018) ITN Access and Use Report. Vector Works. Koenker, H. et al. (2014) Recalculating the Net Use Gap: A Multi-Country Comparison of ITN Use versus ITN Access. PLOS One. Vol. 11, No. 8. Diema, K.K., et al. (2017) Barriers to sustained use of the insecticide-treated bed net in the upper east region of Ghana. International Journal of Community Medicine and Public Health, Vol. 4, No. 2. Babalola S. et al. (2016) Correlates of Intra-Household ITN Use in Liberia: A Multilevel Analysis of Household Survey Data. PLoS One, Vol., No. Strachan C.E. et al. (2016) What drives the consistent use of long-lasting insecticidal nets over time? A multi-method qualitative study in mid-western Uganda. Malaria Journal. Vol.15, No.44. Russell C.L. et al. (2015) Determinants of Bed Net Use in Southeast Nigeria following Mass Distribution of LLINs: Implications for Social Behavior Change Interventions. PLoS One, 10(10), e0139447. Ouédraogo, L.T. et al. (2013) Determinants of long-lasting insecticidal net use in Burkina Faso after a mass distribution in the Diebougou health district. Revue d'Épidémiologie et de Santé Publique, 61(2), 121-127. Awosan, K.J., et al. (2013) Prevalence and barriers to the use of insecticide treated nets among pregnant women attending ante-natal clinic at Specialist Hospital Sokoto, Nigeria. Journal of Public Health and Epidemiology. Vol.5, No.10. Zwede, Ayele, et al. (2017) Knowledge and perception towards net care and repair practice in Ethiopia. Malaria Journal, Vol. 16, No. 396. Hunter, Gabrielle, et al. (2014) “We are supposed to take care of it”: a qualitative examination of care and repair behaviour of long-lasting, insecticide-treated nets in Nasarawa State, Nigeria. Malaria Journal, Vol 13, No. 320. Loll D.K. et al. (2014) “You need to take care of it like you take care of your soul”: perceptions and behaviours related to mosquito net damage, care, and repair in Senegal. Malaria Journal. Vol.13, No.322. Leonard L. et al. (2014) Net use, care and repair practices following a universal distribution campaign in Mali. Malaria Journal. Vol.13, No. 435. This webinar presented in February 2018 provided background and information on insecticide-treated nets, their use and their distribution. This report presents four indicators related to use of insecticide-treated nets (ITNs); individual access to ITN within the household, individual use of ITN the previous night, household ownership of at least one ITN, and the use:access ratio. This guide is intended for use by entities involved in distribution of insecticide-treated nets (ITNs) or organizations that conduct communication activities related to ITN distribution and use. This toolkit contains resources for program planners and NMCPs related to the care of mosquito nets. It includes formative research tools, protocols, and reports; materials developed for BCC campaigns around care and repair, and tools and questionnaires for evaluating net care behaviors. A tool to develop a plan to care for a long-lasting insecticide treated net (LLIN), including a list of care steps and a checklist of the various steps. Ce Plan stratégique de communication pour le changement social et comportemental (CCSC) en République démocratique du Congo (RDC) pour la période 2017 - 2020 vient en appui au Plan stratégique national de lutte contre le paludisme 2016 - 2020. Zimbabwe’s Malaria Communication Strategy (MCS) has been developed to support the National Malaria Strategic Plan (NMSP), which in turn serves to accomplish goals of the National Health Strategy for the same period, 2016-2020.